As usual before a show, I am really busy trying to get bears ready for the show itself. 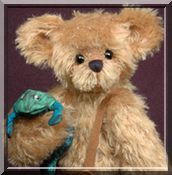 I'll have an assortment of sizes in bears... some 13" bears like Travis, and some 10 & 12" bears...& I won't forget my Half Pint bears and Pocket Bears too! I have some unexciting chores to get done for the show as well... I'm out of business cards, I need new bear adoption receipts, would like a new table cover... Thank goodness I already ordered and received my acrylic stands! I LOVE these! Saturday, October 11 - The American Club, Kohler, WI from 9-3. Admission is $5. More info can be found on their website as well. I would LOVE to see you there! I had been fairly healthy back wise this last year or so, and a week ago Saturday I threw it out again :( How annoying!!! We were having Saturday morning cuddles with the whippets. We have to get up every day at 7am to make sure Isis gets her meds on time, but on the weekends we like to go back to bed and cuddle with the Girls. Athena and Pandora sleep in another room at night because of my back. This was the first Saturday morning cuddles since June as we had been going to the Bristol Renaissance Faire every weekend of the season. Unfortunately, Pandora REALLY cuddled hard into me. I stayed flat on my back instead of turning on my side... and the pressure from Pandora pushed my spine out of whack and stressed my muscles. After a couple of days it felt better.... good enough to take the dogs for evening walks for 2 days. THAT is where I was stupid. It felt better but had not healed completely yet. Now it hurts like HECK! I'm taking care of myself. Since I have had this happen before I know what to do, and I have muscle relaxers too! I think the muscle relaxers are what drive me nuts the most. They really make me sleepy.... and I KNOW that lying down several times a day is what will help my back heal quickly. It's just really annoying when I have bears to make! 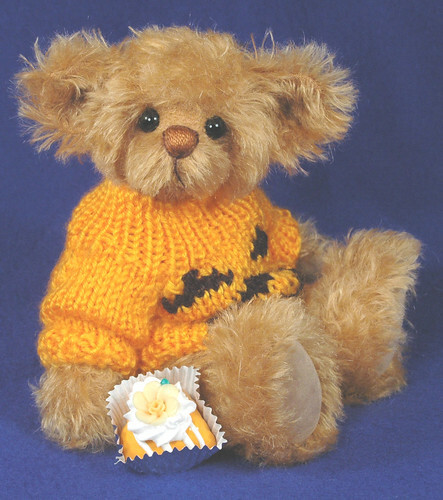 Brach - The New Halloween Bear! The first Candy Corn Clown Bear is done! I just finished him at 10pm tonight. Pictures in the morning!!! I think I had mentioned before that I had a request in my "Teddy Bear Suggestion Box" for a Halloween Bear. Here is that first bear... Charlie! He is a one of a kind bear - I only had one of these adorable little sweaters :) Charlie did get adopted by the bear mom that put the suggestion into the box. 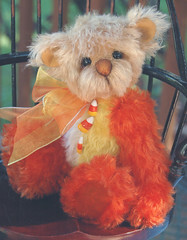 I am, however, very close to finishing my second Halloween bear - a Candy Corn Clown Bear. He will be a the first One of a Kind bear in a series of Candy Corn Clowns. Stay tuned!!! Unfortunately though, I threw my back out again... arrrggghhh!!! I was doing so good for over a year!!! It's bad enough for me to need to take muscle relaxers, which really knock me out >:( But he will get done very soon!!!! Wow, as much as I love going to the Renaissance Faire every weekend in the summer, it is FABULOUS to have my weekends back! It actually gives me back 4 days in my week. It was rainy all weekend - though not nearly as bad as those down in Ike :( But I got a chance to get some housework done and also bear work! Yesterday afternoon I was working in my studio when I heard a big BANG! I should have gone out there to see what happened. Turns out a freight train on the tracks next to our house had derailed. 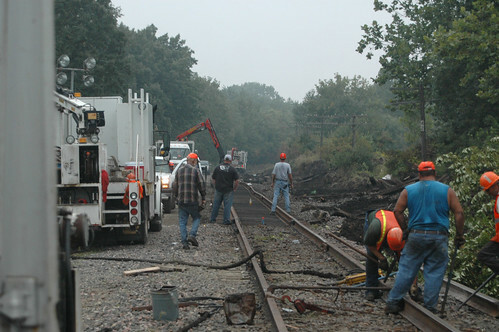 When I heard about it this morning, I went out down the tracks with my trusty Nikon D70. They are still working on the repairs. The RR workers wouldn't tell me anything... so I called our local newspaper to alert them of the story. (evil grin) Sorry, but I want to know ... "HOW did it happen????" Thank goodness I don't think anyone was hurt! There is no crossing near us. 2009 Chicagoland Teddy Bear Show moves to SCHAUMBURG!!! We've had to move the 2009 Chicagoland Teddy Bear Show. It's now in Schaumburg at the beautiful Embassy Suites - just about 10 miles away from our original venue in Elgin. We think everyone will just love the move. When we found out we had to find a new venue, Daphne called around different hotels to see who could meet our needs. She then gave me the list and i went around to visit these hotels in person. Appearances can be so different in person than what they show you on their websites! The Embassy Suites Hotel in Schaumburg was even more beautiful than they led us to believe and very easy to get to. We do think that both the artists and out of town collectors will enjoy having the show just "downstairs" from their rooms - and EVERYONE will love this fabulous new venue to look for that "special somebear" for their hugs! This past weekend was the final 3 day Huzzah! 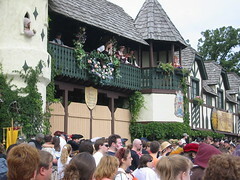 of the Bristol Renaissance Faire for the season. I am both sad and glad that the season has ended. I am sad because we have met so many great people there... and have done TONS of great shopping! I am glad because it took a great deal of time out of my week. Yes, it is only on the weekends... but we went EVERY weekend with the exception of one. I do have a show coming up in a little over a month... and only 3 bears ready! I will still get bears up on the site, but it will still take a bit of time. My friend Daphne got it and when she was done, she put in her address label and sent it to me. After I read it, I put my address label below it and gave it away on my blog. Hopefully people will keep doing this until the inside cover is full of names of everyone who has read it and they will return it to Daphne. I adore mystery books and obviously teddy bears too. So I later got copies of John's other two books: The Mournful Teddy and The Crafty Teddy. I realized I needed to have another copy of The False Hearted Teddy and so I ordered it and now I have an almost complete set. I say "almost" because John has finished the next teddy bear mystery... The Clockwork Teddy. It will be out later this year. I have pre-ordered it and can't wait for it's arrival!